Civic spaces are an extension of the community. When they work well, they serve as a stage for our public lives. If they function in their true civic role, they can be the settings where celebrations are held, where social and economic exchanges take place, where friends run into each other, and where cultures mix. They are the "front porches" of our public institutions - post offices, courthouses, federal office buildings - where we can interact with each other and with government. When cities and neighborhoods have thriving civic spaces, residents have a strong sense of community; conversely, when such spaces are lacking, people may feel less connected to each other. Great civic spaces are really great public places. They are recognized and valued in their cities and towns as places with their own special flavor that relate to and nurture the larger community and bring the public together. The rewards of transforming a civic space into a great public place go way beyond just the space, although the place in itself enriches the lives of its users and enhances its surrounding buildings and neighborhood. Great public places contribute to community health - whether socially, economically, culturally or environmentally. They add enhancement to the civic realm - not only visually, but also in providing a sense of character and a forum for public activities. They can be anchors for downtowns and communities, acting as focal points for definition and foundations for healthy growth. All of these assets, as well as the opportunity these places offer for people to relax and enjoy themselves, add up to greater community livability. Great public places benefit all kinds of communities, from dense urban neighborhoods and downtowns to small towns and suburbs, and from diverse communities to those with a single ethnic group. The following benefits focus primarily on the importance of these places to cities, but they are applicable to every community. Without great public places, there would be no great cities. For example, the skating rink and the other public spaces around Rockefeller Center are one of the most-visited tourist attractions in New York City. Thousands gather there for the annual lighting of the holiday tree or to stand in the street outside the "Today Show" studios, hoping to be on television. These public spaces represent New York the way the Eiffel Tower represents Paris. While people travel thousands of miles to experience such revered places as the Piazza San Marco in Venice, the Champs Elysee in Paris, Las Ramblas in Barcelona, Central Park in New York, Miami's beaches, or Riverwalk in San Antonio, others need only to walk down the street to find places they cherish. Indeed, great public spaces can be world-renowned, or they can be important because the people in a particular neighborhood value them. Community places are just as important to the identity of cities as their more famous counterparts, because they are where the people who live and work in a community experience their neighborhoods and each other. These special places instill a mutual sense of pride and ownership among diverse groups. This can lead to a shared dedication and stewardship for the spaces' continued well-being and foster the teamwork to carry it on. 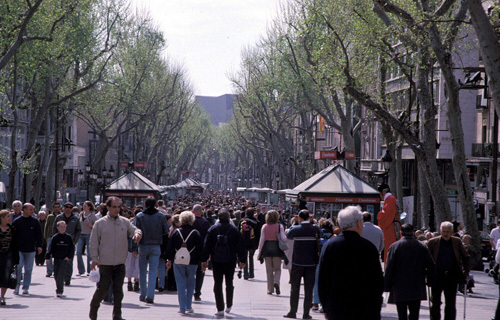 Public spaces that are great places have many real and measurable economic benefits. For example, parks can contribute significantly to the land values in a city. In New York, the real estate values around Bryant Park, Central Park, Prospect Park and Riverside Park are the highest in the city. Minneapolis' prime residential areas are located along the extensive park and trail system surrounding its numerous lakes. California's Pacific Coast beaches and parks provide the setting for some of the most expensive homes in the country. 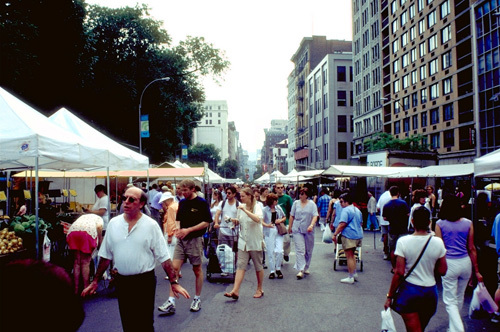 In New York, the Greenmarket on the north end of Union Square has been a major catalyst in revitalizing the surrounding neighborhood and providing opportunities for small-scale entrepreneurship. Upscale restaurants in the area buy produce at the Greenmarket and develop their menus around what is fresh seasonally. Following the example of Union Square, 26 additional greenmarkets are now helping to revitalize neighborhoods all over New York City. Little Rock, Arkansas' River Market has helped bring the city's downtown to life, spurring development of residential apartments, a museum, the relocation of the city's library, and a sports arena. Seattle's Pike Place Market is a major tourist attraction, supporting more than 600 businesses with sales of over $100 million. Revitalizing streets for walking, gathering, and shopping is perhaps the most direct example of how placemaking can benefit a city or town economically. Too many towns suffer from streets dedicated to moving high volumes of traffic quickly - a goal that effectively eliminates foot traffic, parking and other features necessary for healthy street life and economic activity. In New Haven, Connecticut, a new streetscape that incorporated wider sidewalks, large trees, enhanced parking, and a community-inspired leasing and development program, helped bring Chapel Street back to life, rejuvenating an important neighborhood in that city. Great public places also have environmental benefits because they give relief to urban living. Not only do they reduce the need for and dependence on the automobile, but parks and other "green" public spaces, such as waterfronts and wildlife areas, increase people's appreciation for and stewardship over the natural environment, and also provide habitats for animals - for example, Brooklyn's Prospect Park is home to more than 200 species of birds. What is more, the trees and other greenery so characteristic of these places filter out pollutants and freshen the air. Often, public places offer free, open forums for people to encounter art, to enjoy performances, and to participate in other cultural activities. From "Shakespeare in the Park" festivals to string quartets at a downtown plaza, good places foster and enhance a city's cultural life. Providence, Rhode Island's WaterFire, an award winning fire and music installation, has had an impressive cultural and economic impact, attracting hundreds of thousands of visitors to the downtown riverfront on summer and fall evenings. A symbol of the city's renaissance, WaterFire brings people and events to a central urban area that had been typically deserted after dark. These events also bring a great variety of people together and set the stage for positive social interaction.